This Brownie Bottom Cheesecake is made with a fudgy, brownie base, a silky smooth no bake cheesecake and topped with piles of fresh raspberries. It’s an elegant holiday dessert that’s also naturally gluten free! This Brownie Bottom Cheesecake combines all of my favorite things: chocolate, cheesecake, and fresh, juicy berries! It is April 11 (my littlest is 5 months old today!) and we are supposed to get a dump of snow. Mama’s not happy about it. Last week I was on the hunt for fresh strawberries and I stopped at 3 different grocery stores before I could find a single container. I did, however, find a pile of the most gorgeous raspberries and it’s got my mind on this cheesecake, friends. The base for this cheesecake is the best, fudgiest brownies ever and they also happen to be naturally gluten free. Since my brother-in-law has Celiac disease, I love having a few easily gluten free desserts in my back pocket! The brownie recipe is from the cookbook Flourless by Nicole Spiridakis and I think it’s the best I’ve ever had. For the cheesecake, I doubled up on the chocolate and added some melted white chocolate in the cheesecake layer. When it firms up, it gives the cheesecake a luscious feel and helps it to set, and gives the most subtle white chocolate flavor (if you have people who don’t like white chocolate, they will probably never know it’s there! If you want, you could easily swap out for dark). 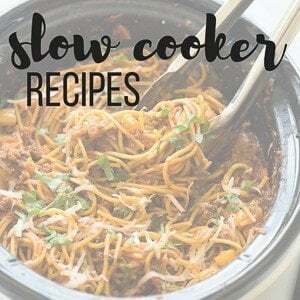 Add on some fresh berries: raspberries, strawberries, blueberries, or if you’re opposed to fresh fruit you can switch things up and add a drizzle of caramel and some toasted pecans for a Turtle version. I can just imagine how crazy good that would be! But with Spring upon us (it’s coming, right?!?) I just had to top it with fresh fruit. I am so ready for all the fresh produce! Watch the recipe video for this Brownie Bottom Cheesecake! 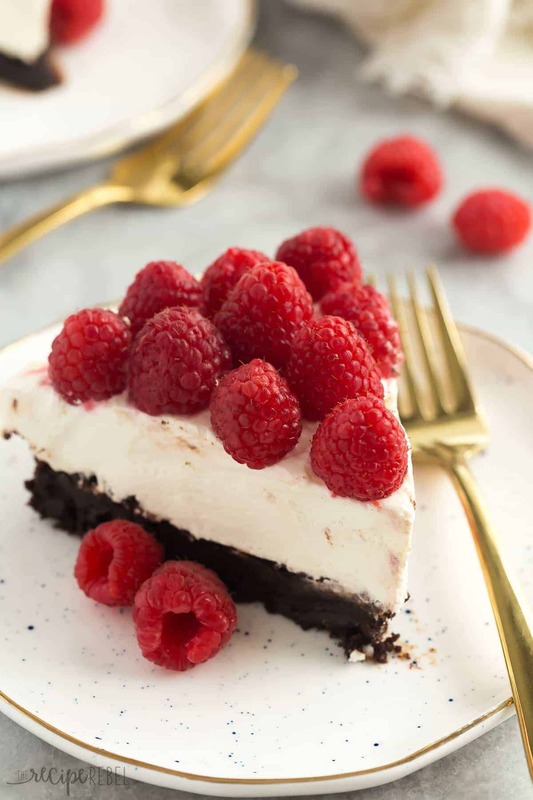 This Brownie Bottom Cheesecake is made with a fudgy, brownie base, a silky smooth no bake cheesecake and topped with piles of fresh raspberries. It's an elegant holiday dessert that's also naturally gluten free! Brownie basePreheat oven to 350 degrees F. Lightly grease a 9" Springform pan and wrap the bottom with foil. Set aside. In a large bowl, combine chocolate and butter. Microwave on high in 30 second intervals, stirring each time, just until melted and smooth (don't overcook!). Whisk in brown sugar until smooth and let cool slightly (about 10 minutes). Whisk in eggs, one at a time, until combined. Stir in cocoa powder, salt and vanilla until smooth. Pour batter into prepared pan and bake 35-40 minutes until top is dry and a toothpick inserted in the center comes out mostly clean. Let cool completely. CheesecakeWhip cream until stiff peaks form. Set aside. In a medium bowl, combine white chocolate and milk. Microwave on high in 20 second intervals, stirring each time, until melted and smooth. Set aside to cool slightly. In a large bowl, beat cream cheese until smooth. Add sugar and vanilla and beat until smooth. Add white chocolate and beat until smooth. Fold in whipped cream as best as you can, using an electric mixer on low speed to combine if necessary. Spread on top of brownie crust. Cover and refrigerate until set, at least 4-6 hours or overnight. Top with a layer of fresh raspberries just before serving. Store leftovers in the refrigerator up to 3 days. so 10 oz of cream cheese wasn’t enough. they whole thing was sliding all over the place when I was cutting it. terrible mess but the children ate it up anyways. next time I’ll definitely double check the recipe! Sorry that happened! I hope you try it again! I love cheesecake and the boyfriend loves brownies, so this is an awesome recipe to make us both happy. I love it! You said that you doubled up on the chocolate & added chocolate chips in the cheesecake part. Is this over and above what the recipe calls for? 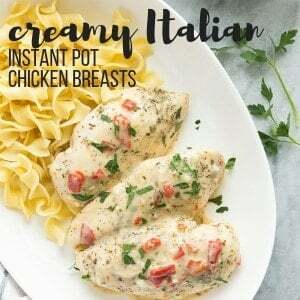 I would love to make this recipe for Mother’s Day. There isn’t anyone that loves chocolate anymore then I do except maybe my Mom. Thanks. The chocolate is in the recipe already — the white chocolate 🙂 I hope you enjoy it! You said that you doubled up on the chocolate & added chocolate chips for the cheesecake part. 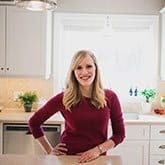 Is that over and above what is called for in the recipe? I want to make this for my Mom for Mothers’ Day, but of course I would have to make a taster first. LOL. No one loves chocolate more then me, except maybe my Mom. This does look fabulous…but has anyone made it? Does it turn out as good as it looks taste wise? Could you give me a conversion into Grams and milliletres please. The websites I used for conversions gove me different ones each time and don’t want to mess it up as it looks amazing. Thanks. For the brownie bottom, is the good chocolate baker’s chocolate? If not, could you be more specific as to what type? You can definitely use that! I often buy a good solid bar of chocolate at the grocery store to use. This recipe looks delicious but seems a little difficult for my skill level. Could I make the base with box fudge brownie mix? Do you take the cake out of the pan to serve it? Yes, or you can leave it in! Just remove the sides. I have never thought to combine the fudgy-ness of a browine with a creamy cheesecake! 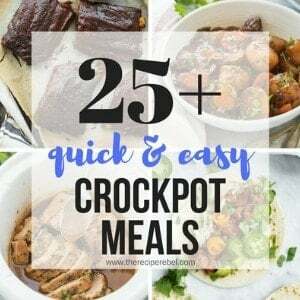 I also love that this is a gf recipe! Looks very delicious and fresh with the pop of the red raspberries! I just love this time of year too even though there is so much more running around to do. This cheesecake is a such showstopper, Ashley! 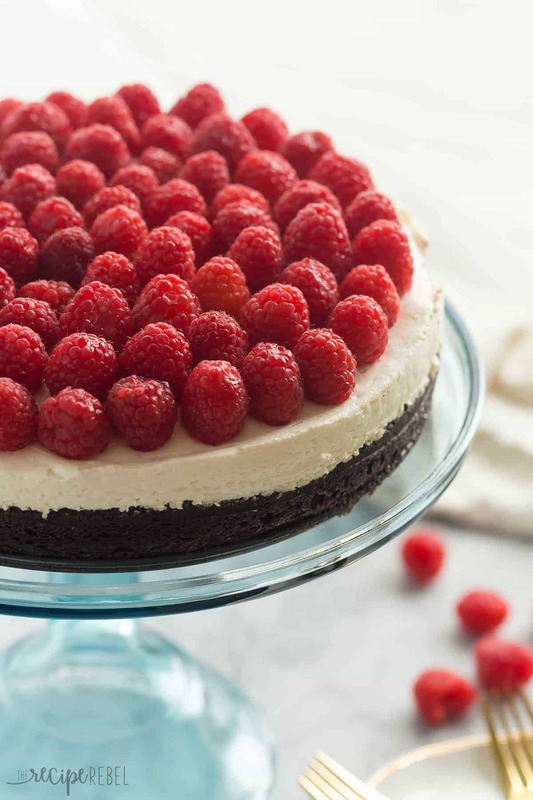 The raspberry topping is SO pretty and combined with chocolate is perfect for the holidays! Won’t the brownie layer harden up when kept refrigerated? It is so fudgy it won’t get super hard. This is such a beautiful holiday-worthy dessert! 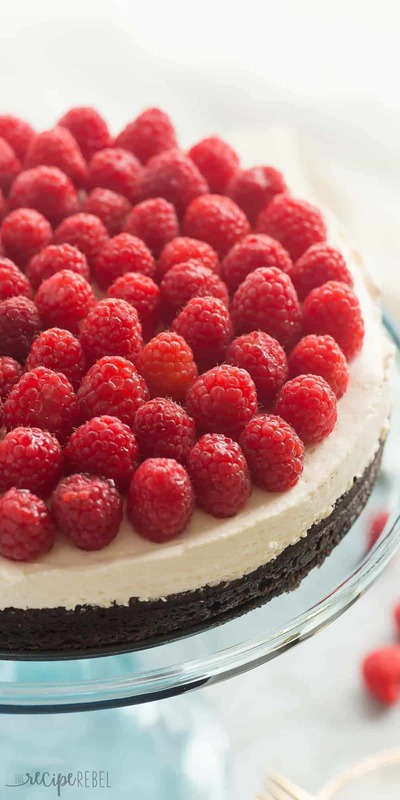 Combining cheesecake with a brownie crust was a delicious idea, and I love all the fresh raspberries on top! I dove into one or two myself! Lol. Thanks Rachel! Hi Ashley! What an elegant dessert! I also love chocolate and raspberries! I have made raspberry truffles using Chambord liquor and fresh raspberries, way better than strawberries! I’m still in awe that the holidays are almost here! Where has the time gone?! This cheesecake looks so good, Ashley! I love brownie bottom cheesecakes, it’s the best kind of crust in my opinion!